Last week I prepared a Beet and Daikon Salad with Ginger Rice Vinegar Dressing as part of my freelancing for Robyn Webb. This was not the first time I ate raw beets: I've tried them in a Mark Bittman recipe, and created my own raw beet salad with fried goat cheese medallion for a cooking demonstration at a farmers market. 1. 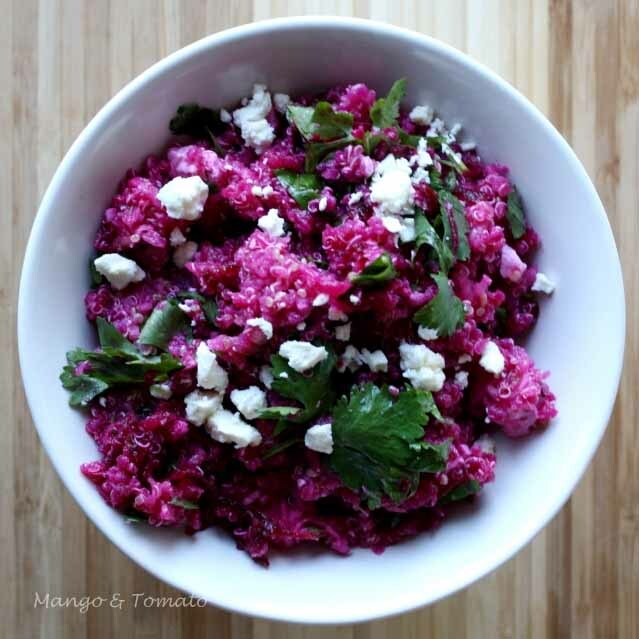 Combine quinoa, grated beets and daikon radish and cilantro. Drizzle with olive oil and season with salt & pepper. 2. Top the salad with crumbled feta. Serve either at room temperature or straight out of the refrigerator. Have you tried raw beets yet? If so, what's your favorite recipe that uses them? Love the gorgeous bright pink color! Quinoa is so delicious on it's own, I can imagine it was even better with the sweetness from the radishes! Wow, this is just so pretty! Although I like beets, I've never cooked with beets at all because i am always under the impression that they make a huge mess and stain everything... and I hate cleaning LOL. Where can I buy beets and Daikon? I have lots of quinoa and always looking for a good recipe. Thanks. Oh wow, that color is stunning! I've never tried raw beets, but beets have gone from being pushed aside on my plate to one of my very, very favorite things to eat. I'll have to try grating them into a salad soon. Your salad looks very pretty! 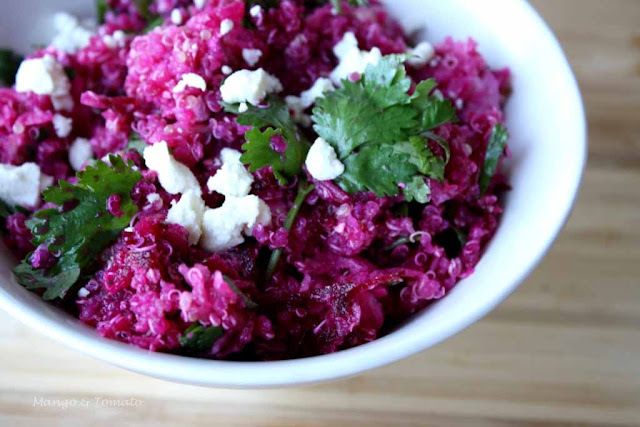 It looks like you used light-colored quinoa and it got its pink color from the beets. I wonder what the salad would look like it you used red quinoa, which is already basically beet-colored. I've tried raw beets paired with homemade tvorog (soft cheese similar to quark), splashed with balsamic vinegar. I may have also added walnuts. It was all right but I enjoyed this dish much more when I made it with beets that were briefly sauteed in a bit of olive oil, a process that brought out their sweetness. You always come up with the most interesting combinations. I so love the color of this salad! wow, SO colorful. Looks amazing@! O I think I would make it for the beautiful color alone Olga! But the combination of flavors here would be really good too, I am sure of that! What an amazing color. It looks delicious. Wow! Such vibrant colours. The salad looks amazing. MMMMMMM,..what a tasty & super giod for you salad this is!! i love all of these tasty flavours! Yummmmmmm,..I also love fresh peeled & grated & or cut into chunks raw beets or beet juice too! I loved this recipe! Just made it last night and the raw beets were really delicious! Thank you so much for letting me know! I'm glad you liked the recipe. Raw beets are great! Love beets and quinoa. It's a great combination!